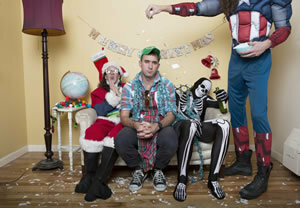 KXCI On The Air: Sufjan Stevens Christmas Sing-a-Long at The Rialto Theatre, KXCI Presents! Sufjan Stevens Christmas Sing-a-Long at The Rialto Theatre, KXCI Presents! Sufjan Stevens brings his Christmas Sing-A-Long concert to The Rialto Theatre on Monday, December 3rd, in a KXCI Presents! show. Sufjan Stevens is jingle-jangling across America, bringing yuletide cheer and sharing reverent hymns and pop carols from his new Christmas box set. His creativeness on albums like Illinois can be heard in his voluminousness output of Christmas music featuring traditional songs, classics and new compositions done with reverential and experimental spirit. All Grinches be forewarned: the show will consist entirely of Christmas music, inviting audience participation, with special guest Sheila Saputo, aka Rosie Thomas.